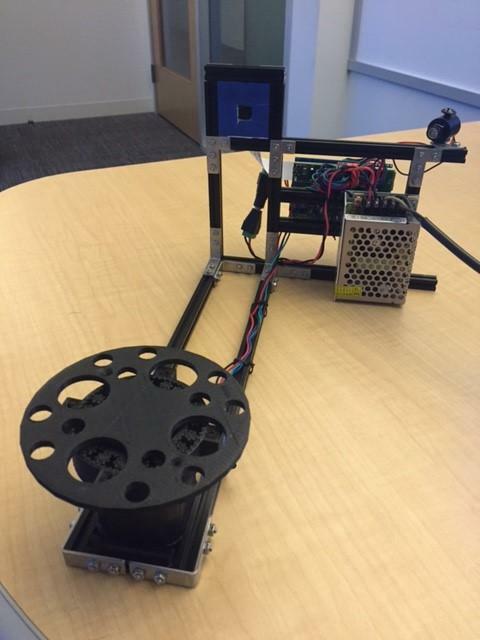 Raspberry Pi opens a lot of possibilities for do-it-yourself projects. It’s affordable and full of potential for implementing challenging projects. 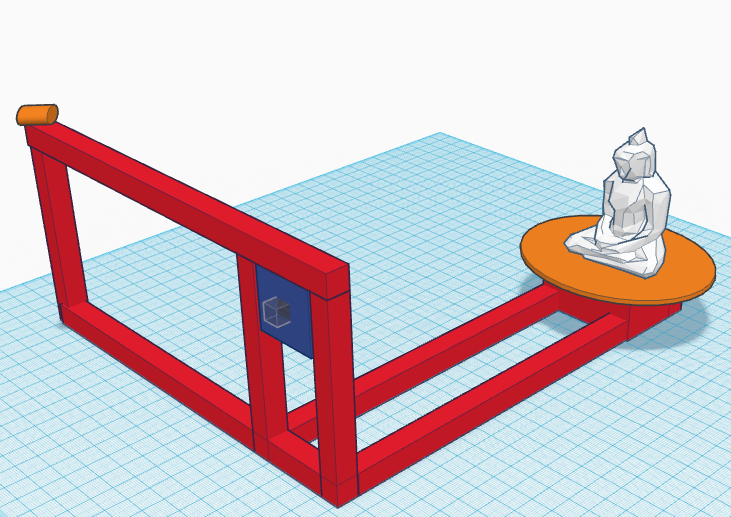 After having spent several years tinkering around my 3D printer, wanting to build my own 3D scanner to complete the 3D workflow was an exciting idea. 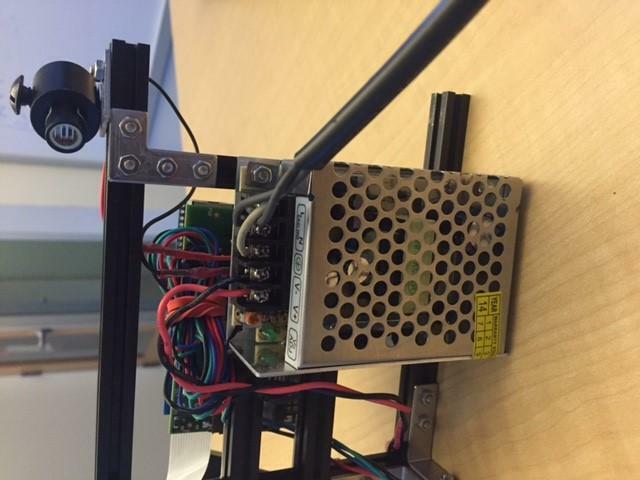 Using MATLAB and the Raspberry Pi hardware support package for development made the experiment quick and easy, at least from the software perspective. 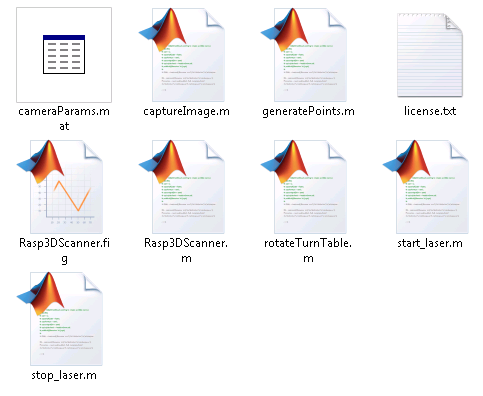 Now, let use this information to build our basic scanning algorithm. In order to extract 3D information of each point lying on the surface of the object, we need to first determine the points at which we can extract this information. This can be achieved very easily by capturing two images – once without the LASER on and once with the LASER on. 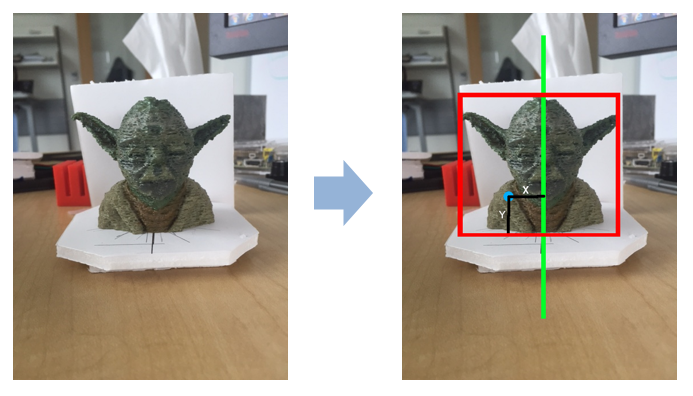 Since everything else in the view of the camera remains the same, difference of the two images should give us all the points that lie on the LASER line projected on the object. By converting the difference image into a binary image, we can remove most of the extraneous information in the difference image and mark all points lying on the LASER line in white and the remaining pixels of the image as black. We can further narrow down our region of interest by making assumptions about the rectangular area that covers the entire object in the image. 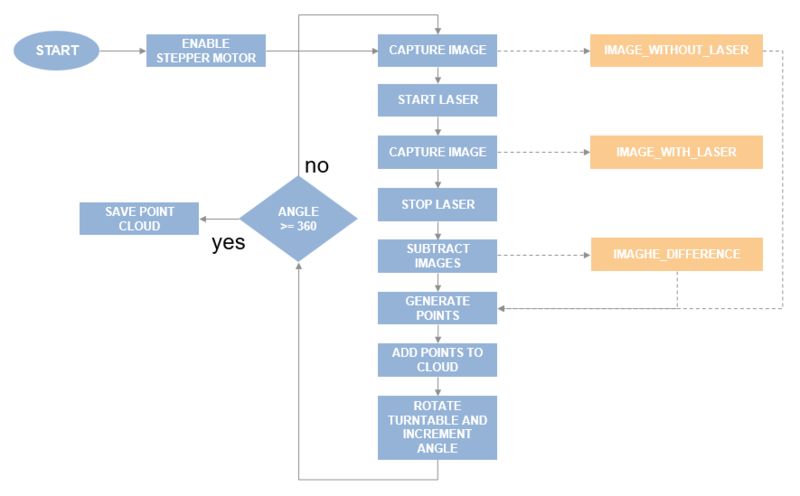 Figure 5: Taking difference of two images of the object – one with the LASER line projected and one without, helps us extract the points that are projected onto the object. 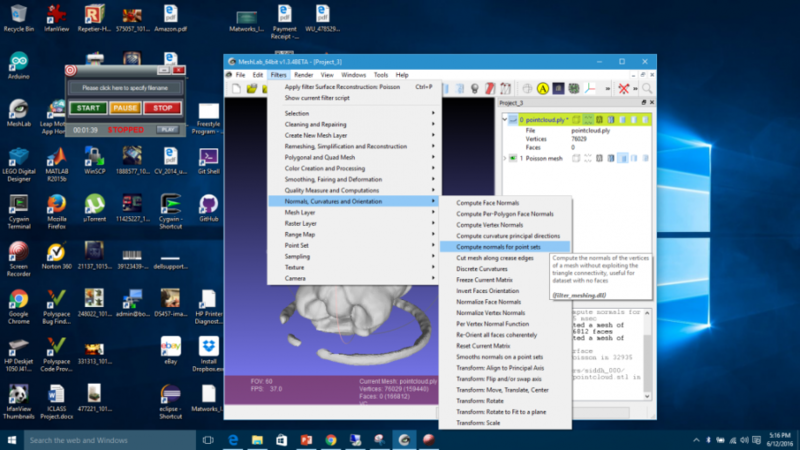 Now we have all the necessary components available for extracting the 3D coordinates of every point lying on the surface of the object. There is still one part that still needs to be taken care of. The points extracted from the images lie on the same image plane and are not oriented correctly in the 3D space. For this, we need to rotated each extracted 3D point by some amount about the axis of rotation. By carefully keeping track of the rotation of the object, we can easily determine the angle by which the points need to be rotated after each rotation step. The final algorithm looks something as shown in the image below. For the Stepper motor control circuit, we are using the EasyDriver board (link). This board takes away all the pains of having to build a voltage-regulated power supply that can deliver consistent and enough current to run a stepper motor, along with the PWM control signals required to run them. 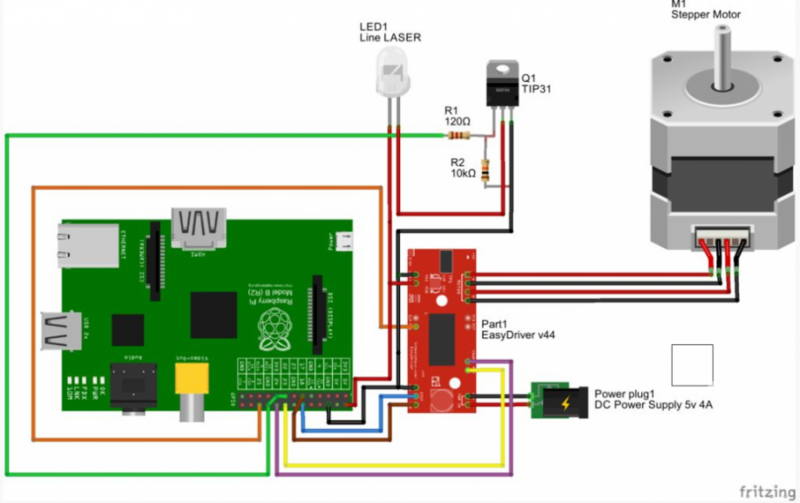 With this board, all we need to do is connect a dc power supply with a high-enough current rating (4 Amps is sufficient), connect the control lines to IO pins on the Raspberry Pi, connect the stepper motor to the motor output, and you are ready to go! It really is that simple. Thanks Brian!!! And Did I mention that EasyDriver also provides a regulated 5v output that can drive other circuits? Well, yes it does! So we will be powering up the Raspberry Pi and the LASER diode with this regulated supply! Double Thanks Brian!!! ENABLE – When this control signal is low (0v), the motor output is enabled and what signals are applied to the other control signals, get propagated to the stepper motor. We connect this pin to one of the IO pins on the Raspberry Pi (Pin 24). We have to remember to set this pin to logical 0 whenever we want to enable the stepper motor and to logical 1 whenever we want to disable it. 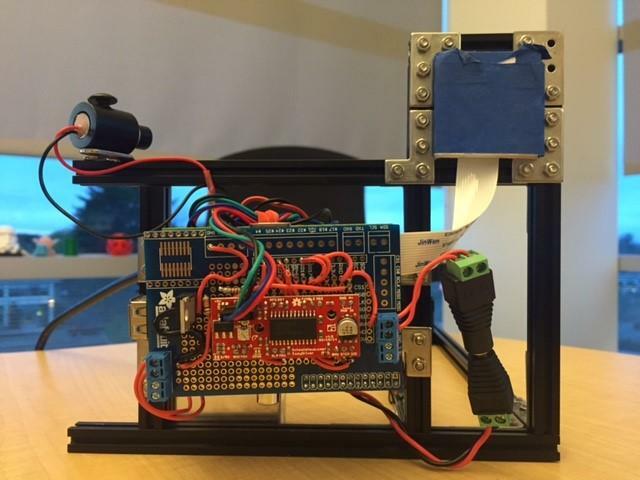 STEP – this control line drives the stepper motor. When we apply a pulse to this line (000011110000), the driver moves the stepper motor by one step when the line transitions from 1 to 0 (also called the falling edge of the pulse). We connect this line to Pin 18 of the Pi. We will write a small MATLAB function to send a pulse on this IO pin. More about that in the software setup. DIR – this control line decides whether the stepper motor will rotate in the clockwise or counter-clockwise direction. We will connect this line to Pin 17 of the Pi. Setting this line to logical 0 makes the stepper rotate in clockwise direction and logical 1 makes it rotate in the counter-clockwise direction. Once you have everything set up correctly, place any object on the turntable (adjust it such that its own central axis coincides with the axis of rotation). 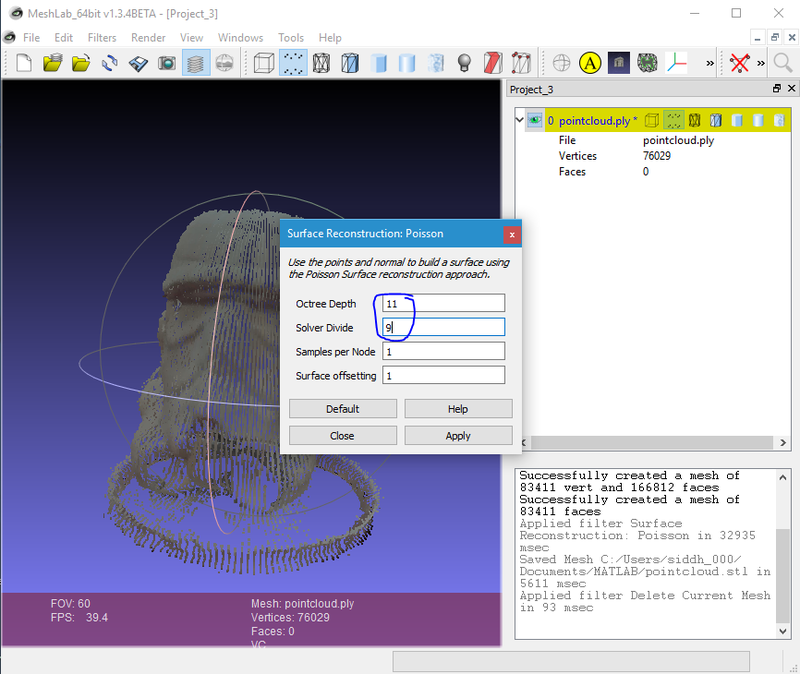 Hit “Start” on the GUI and wait for the scanner to show the completed scan on the 3D plot. If you are satisfied with the output, save the point cloud by hitting the “Save” button. Once the dialog opens, select a reasonably high value for the octree depth to ensure a smooth mesh is generated within the point cloud. 4. Now that the mesh is generated, you can export it as a “.stl” file. 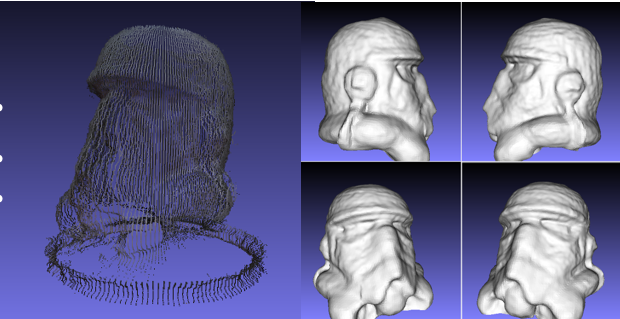 By now, you should have a scanned mesh generated by the Rasp3DScanner. 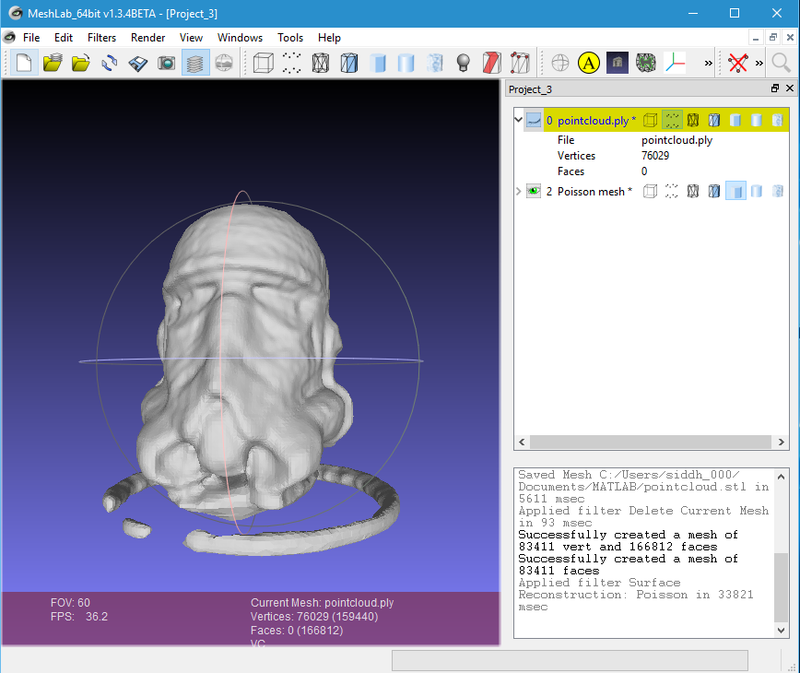 You can explore cleaning up the mesh and preparing it for 3D printing using tools such as NetFabb Basic. You can also further explore improvements to the scanning concept by trying out other scanning techniques such as stereo-imaging and multi-camera setups.